Replacement strips are made from the same high quality, fire resistant material found in our PVC bulk rolls. The replacement strips are cut to the dimensions you request and offer a fast, affordable way to make repairs to your strip door. The replacements are designed to fit the hardware mounting styles of most manufacturers. PVCStrip.com offers more than 35 varieties of replacement strips. Each strip has rounded edges that enhance longevity and improve safety. Our replacements come in smooth, ribbed and reinforced styles and can be standard (clear), low temperature, opaque, tinted or frosted, depending on the type of PVC you require. No matter what size or type your strip door is, there is a PVC replacement strip that will meet it. Discounts are available for PVC replacement strips that are ordered in bulk quantities. Each PVC strip is punched with 3/8 inch diameter holes on 2 inch centers and can be remounted to the existing door in a matter of minutes. 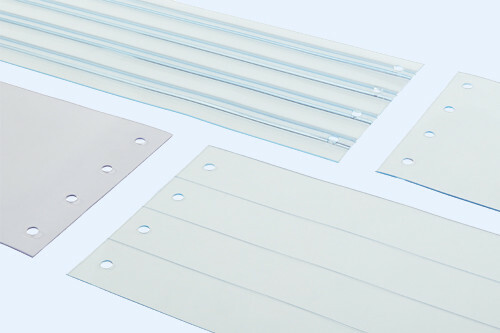 Representatives at PVCStrip.com are on hand and able to assist you in selecting the right strip with the right overlap. Get the replacement strips you need without disrupting workflow or hindering productivity. If you have any questions, please call 888-303-8515 or contact us.